We are deep into what is California's version of winter - grey, gloomy cloudy days and occasionally even rains - yes, we do have a brutal weather system here :P Anyway, I braved the "winter storm" to go to my local Nordstrom because, apparently, in the makeup and beauty world its already spring! The Chanel Spring 2013 Makeup Collection - Printemps Precieux de Chanel - turned up online earlier this week (still not on the Chanel website, though) - and is now available at a lot of the Chanel counters. I ordered a couple of the items online - not my smartest idea since I have no clue when I will get them - so no reviews right now, but I did get to swatch most of the products! 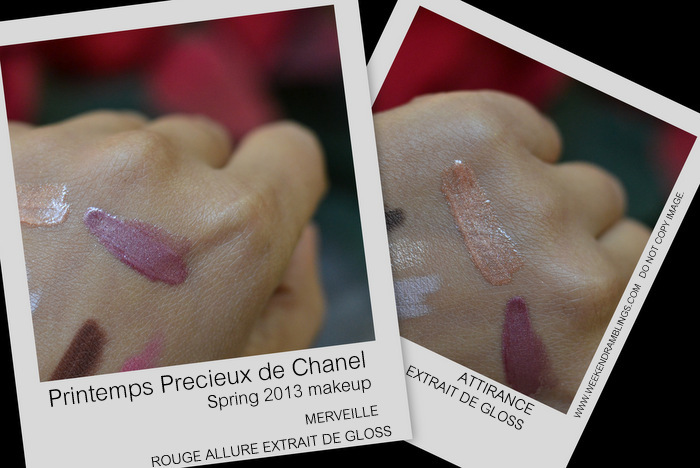 Rouge Allure Luminous Intense Lip Colour - Fantasque, Precieuse, and Envoutante. 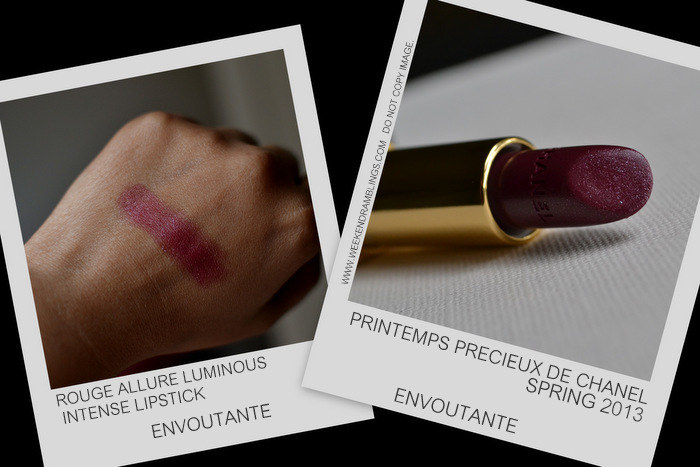 Rouge Allure Velvet Luminous Matte Lip Colour - L'Eclatante and La Favorite. Stylo Yeux Long Lasting Waterproof Eyeliner - Or Rose, Santal, and Beryl. 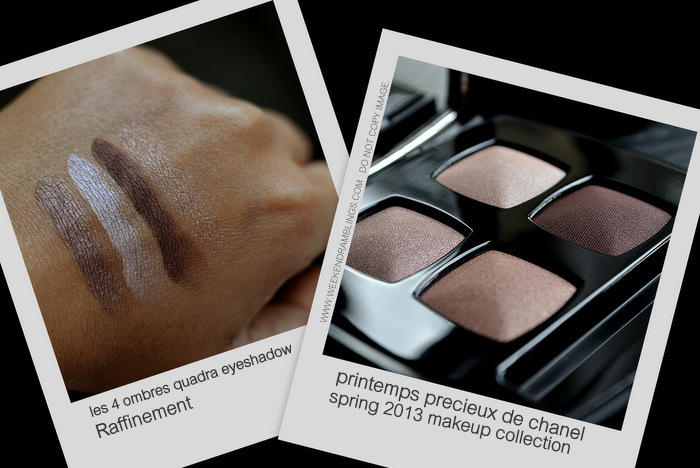 Information regarding the Printemps Precieux de Chanel Spring 2013 Makeup Collection from www.jaydeddreaming.com and www.shop.nordstrom.com. It's a little too early for spring makeup collections, but I do feel some of the pieces from the Chanel 2013 makeup collection would fit in nicely for the holidays and make some really pretty gifts too - Poudre Signee de Chanel Illuminating Powder and the eyeshadow quad in Raffinement would be my favorites. You got Frivole ??? is super preeetttyy ! Hi Lakshmi :D I couldn't think of a better word :D :D :D Frivole looks nice, but with blushes I never know till I actually put them on my cheeks - I just hope this doesn't turn out too ashy.. evveerrrrrthhinngg??!!! almsottt??!!! now I will spend the entire dayyy grumpy frumpyy.. me also wantss !! hmmph! You got almost everything.. Goddddddd I fainted.. Thank you for the amazing swatches! I am looking forward to this collection. Hi Martha! Do you have a favorite from this collection? Did you pick up anything from this collection, Michelle? I posted a swatch on my Twitter page through Instagram and I tagged you but I think I got your name wrong :(. I saw a display at Neiman Marcus on Saturday but they didn't have the products in yet. I'll probably go in on Wednesday to see if they have them in. The 3 nail polishes, Palissandre and Reubellete lipliners, the lipgloss in Marvelle, the lipsticks in Envoulante, L'Eclantate and La Favorite, the eyeshadow quad and the illuminating powder. Oh I go check on Twitter right away :D I also ordered the 3 NPs, and Mervielle, and I got Envoutante..I think you will like it..it looks so dark but is a pretty color on the lips..and I am in LOVE with the illuminating powder! I like the gloss - Merveille. The top row of the quad reminds me of sable emouvant from the summer. Can you do comparison swatches?